Who says you can’t eat well while camping? 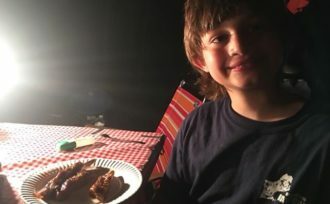 Steak tips, rigatoni, ribs…these are just a few of the delicious meals Michael Barton and his son, MJ, cooked up on their two week camping excursion over the 4th of July. The two set up camp – hammocks and all – first at Woodford State Park and then Emerald Lake State Park. If you recall, it was sweltering in early July, so they were thankful for clean, refreshing water and long days at the beach! In August, the Massachusetts natives made their way back to Vermont, camping in beautiful Smuggler’s Notch State Park. They explored the nearby area and restaurants, in a addition to cooking up their own yummy meals of course!